As the Premier League finally returns this weekend, we’ve got a fantastic game in store as Everton play host to Manchester City. 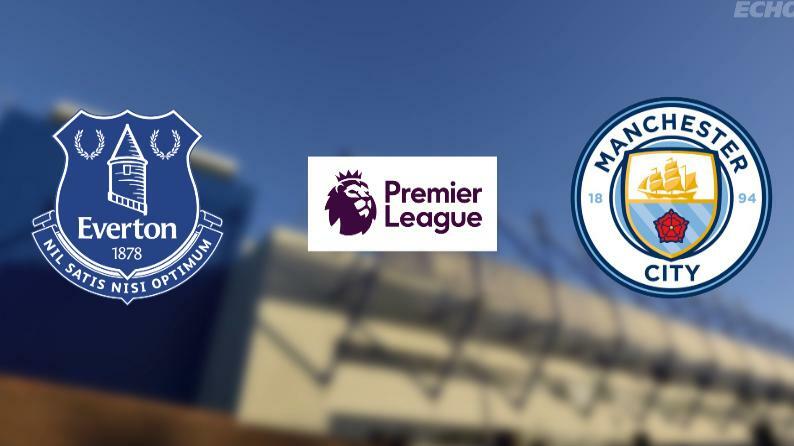 With City in such a commanding lead of the title, and Everton in desperate need of some extra points to secure survival, this match should be one to watch for sure. Everton are presently without Idrissa Gueye in the midfield, while fellow midfield engine Tom Davies will likely miss out also. Ashley Williams is out with suspension, though some may argue that, on present form, that’s a help rather than a hindrance. The loss of Gylfi Sigurdsson pre-international break will be a major blow for the home side, too, joining Eliaquim Mangala and Mason Holgate as absentees. Meanwhile, City turn up here with a bit of an injury problem themselves. Sergio Aguero is likely to miss out, though will likely be fit for midweek. Fabian Delph has been out for a while, and may return at one stage though not likely as a starter. With Benjamin Mendy finally in training, too, the full-back should offer an opportunity for Pep Guardiola to get him some much-needed gametime. City come into this one in good form, though, and should have more than enough to see off a brittle Everton side who look like they want the season to end. We reckon this will be an easy one for the away side. Everton aren’t great, and often struggle against sides that play with tempo and quick passing. While they have improved slightly under Sam Allardyce, their improvement does not suggest they’ve got enough in their locker to take anything here. City’ main problem will be their awkward record against Everton historically, and the fact the game falls just before a massive match-up with Liverpool in the Champions League. Are things looking (im)peachy for Trump? We live in wild times politically and so it's always interesting to keep one eye on the betting odds, to get a measure of what those who like a flutter make of such strange times. 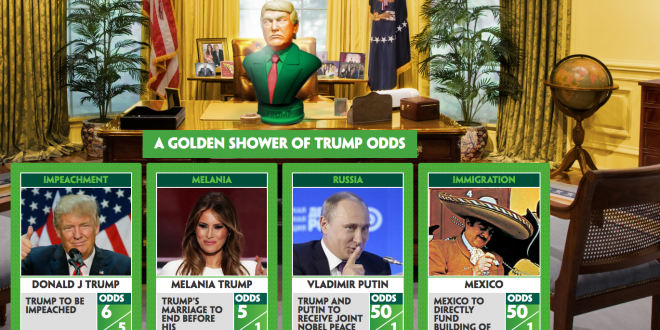 The more quirky bookmakers out there offer both serious and novel political bets, especially around the US elections, since it's 'mad season' over there right now. But novel bets aside (since I'm not sure that PP's 'Donald Trump to buy Sports Direct in 2018'' represents good value!) 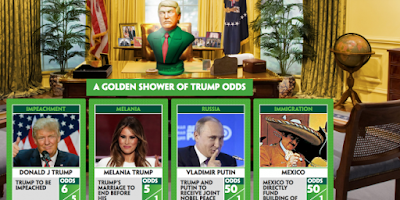 the one bet I've had my eye on is 'Will Trump complete his 1st term in office? ' Right now the odds are YES 3/10 and NO 2/1 . Interestingly for a good time the odds were basically even money for both outcomes and in some ways with the midterms still to come and the investigation into Trump and co yet to be concluded there's still a fair amount of scope for Trump leaving office. That said his own party and the 'alternative fact' portion of the public may well decide to prop him up come what may. As always, time proves everything. A wide-open looking renewal of the 3m Stayers’ Hurdle is one of the feature races on day three of this year’s Cheltenham Festival, taking place on Thursday, 15 March. The ill-fated 2017 winner Nichols Canyon suffered a fatal fall over the Christmas period in Ireland, so we are guaranteed a new staying hurdle champion at Cheltenham this time around. Those horses who chased him home at last year’s Festival, Lil Rockerfeller and Unowhatimeanharry haven’t been any sort of form over the trip since. It makes for a lively betting market, so we take a look at four of the main contenders. The first of two winners at last year’s Festival at a prominent price is Coral Cup victor Supasundae. Trained in Ireland by Jessica Harrington, has won just one of his four starts since. That came last time out 2m in the Irish Champion Hurdle at Leopardstown’s inaugural Dublin Racing Festival in February. It was a superb bit of race placing by connections of Supasundae, who is yet to win a 3m contest in two previous attempts but is made favourite for the Stayers with Williamhill. Will it be third time lucky or could a re-opposing rival confirm the form of last season’s Liverpool Hurdle from the 2017 Aintree Grand National meeting? Northern trained winners at the Cheltenham Festival are a rare enough thing these days, but their best chance of one this year comes here through rapid Jedd O’Keefe improver Sam Spinner. The six-year-old absolutely bolted up in a hot Grade 3 handicap at Haydock on Betfair Chase day back in November. Sam Spinner then continued his rapid progress with success at the highest level in the Long Walk Hurdle at Ascot just before Christmas. That is a key trial for the Stayers, but it’s the fact that conditions at Cheltenham could be soft ground that are the biggest plus for this young horse. Connections sent last season’s Champion Hurdle favourite Yanworth, who flopped at the Festival, over fences at first for this campaign, but he is now back to tackling the smaller obstacles. Owner JP McManus faced a similar decision with Buveur D’Air last season and the return to hurdling was a masterstroke. It could also prove the same with the Alan King-trained Yanworth, who defeated Supasundae over the Stayers’ trip at Aintree as mentioned above. That form gives the eight-year-old claims of a successful winning return to this sphere and like Sam Spinner he is unbeaten over 3m. McManus’ retained rider Barry Geraghty, meanwhile, has chosen Yanworth over Unowhatimeanharry. Top Irish trainer Willie Mullins may have lost Nichols Canyon, but has 2017 Albert Bartlett Novices’ Hurdle hero Penhill in his ranks. This seven-year-old is completely unexposed in open company over 3m because he hasn’t raced since last year’s Festival. Just how race fit Mullins can have got Penhill for this stern test remains to be seen. Punters may recall the superb feat of training the master of Closutton pulled off with Arctic Fire 12 months ago, however, who returned after more than 400 days off the track to win the County Hurdle. Penhill, meanwhile, has received support in the Stayers’ betting after his odds were cut from 10/1. With another fantastic Grand Opening Day, Ladies Day and Grand National Day in store, Grand National Festival 2018 is going to take place from April 12-14, 2018. Apart from the guest competing for the coveted “Best Dressed” competition on Ladies Day, it will also include a big race that will feature 40 horses to follow in the hoof prints of Red Rum, thus competing for the grand prize. Indeed, one can go through the history of the legendary runners and riders who have triumphed in the Grand National. Undeniably, each of them demonstrated the blend of endeavour and fortitude. Once again, it’s time that the whole world will stop in its track as 40 horses and jockeys will line up to race. Adding more to the information, Grand National is a premium event on the National Hunt Horse racing calendar that is held every April at Aintree Racecourse in England. Online betting in Grand National is quite popular among people who do not normally watch or bet on horse racing at other times of the year. Thus, it has always remained the most popular horse racing betting event worldwide. Owing to its length and strain that is placed on both the horses and the jockey throughout, it is also referred to as “the ultimate test of horse and the rider”. Due to its relevance throughout the year, Grand National has always been popular. When you are opting for online betting in Grand National Festival, it is quite important that you understand all the odds. It is considered that the optimal time to place a bet is early on the day of the race. Each WayBeing an extremely popular horse race betting, each-way bet involves placing money on a horse that you expect to finish within the places. Bet withoutIt allows the bettors to back a horse to win if in case their favorite is not involved in the race. It gives them an opportunity to bet on a different horse at different odds. If you are planning to bet online for Grand National, especially for Grand Opening Day on 12th of April - you need an account. The first question is, where to bet n Grand National Opening Day? You can go through some excellent online betting sites out there like reputable UK bookmaker William Hill. It is of a great significance that you bet with the licensed betting sites. Avoid the unlicensed operators, as you will have no guarantee if anything will happen to your money. Although the bookies usually accept bank cards, yet if you wish to use a different method to pay, you need to confirm if they accept them in advance. Of course, there is no limit to the number of options available at Aintree if you are planning to impress your friends or colleagues by splashing the cash.